Things are winding down at the River City Food Bank at 2 p.m. on a Tuesday. “But they are still coming,” says Executive Director Eileen Thomas. “We’ve had 156 today and will have more.” Volunteers hand out about 180 food bags a day to individuals and households,five days a week. By the end of the month, numbers will reach 5,200-5,500 households from the Sacramento area, she says. 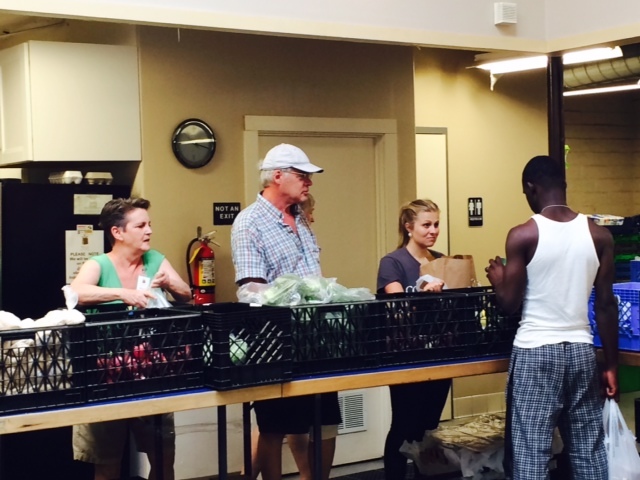 River City is the oldest continuously serving food bank in Sacramento County. The concept is to provide healthy emergency food and other assistance such as referrals, senior programs, nutritional counseling, cooking classes and children’s snack bags. Besides the areas for storage and pick up of food, the small space at 1800 28th Street, manages to house cubicles for people to talk about private issues with volunteers versed in the services that are available to help them become self-sufficient. “We call this a choice food bank,” she says. “Most other food banks have prepackaged the food that recipients will get. Here they have a choice. Food is a personal thing. Maybe you don’t like canned potatoes. Here you can say that you don’t care for them, but that you really like diced tomatoes. They rely on food donations and surplus food donations. Staples they purchase on a bulk basis—peanut butter, tuna, eggs and dairy products. Most of their money comes from generous individuals and foundations. Much care is taken to provide programs for the most vulnerable members of the community, like seniors. 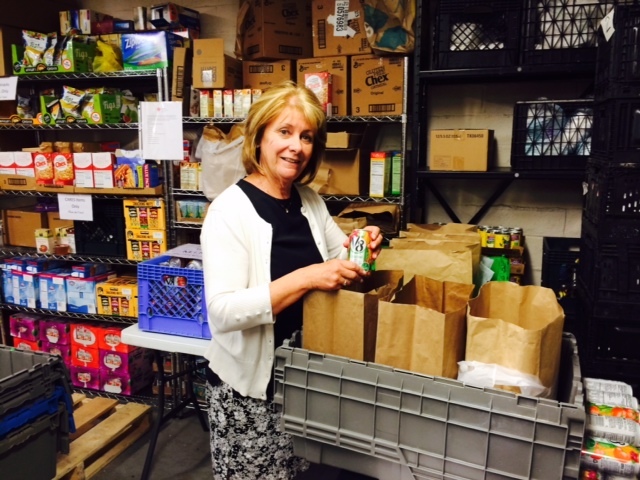 The food bank’s MIM program, Most Important Meal, offers weekly bags of healthy breakfast foods. They pack up and deliver kits—enough for a week—with V8 juice, crackers and cheese, granola bars, packaged and fresh fruit and gluten free granola. Eileen says the food bank is really filling a need for low-income seniors. Then there are the BackSnacks for the kids, nutritious snack bags designed to tide children over the weekend when they might not be getting adequate food. These they deliver to seven schools in the area on Fridays during the school year. Eileen takes me back to the area where food is stacked on shelves and the walls are lined with freezers and refrigerators. Fresh produce that day is cabbage, slaw, zucchinis and yellow squash, chopped salad with broccoli and bagged lettuce. Eileen describes her volunteers as fabulous. “We are really a volunteer-fueled operation.” And they have to be versatile. “Every day is different.” A day she remembers in particular is Oct. 21, 2010, when the building they occupied on 27th Street burned to the ground. The day after they were serving out of Goodwill truck. Soon after, Trinity Cathedral offered a space. When it became too little, the food bank moved across the street to a Sutter Medical Center facility. In 2011, they finally had enough money to purchase their present location.